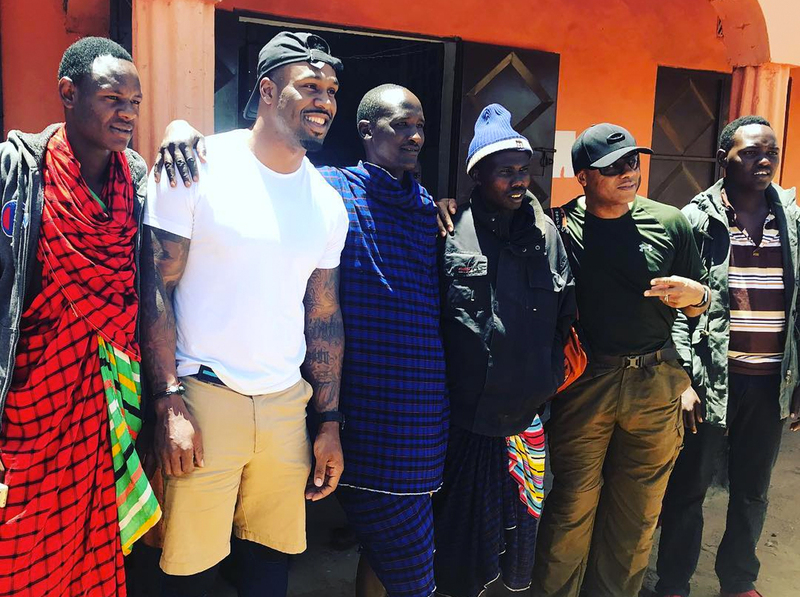 I recently returned from an amazing and life-changing trip to Africa, and I’m excited to share the details of what made it so special. I’ve been known to travel the world, but never before had I taken a trip with so much purpose. 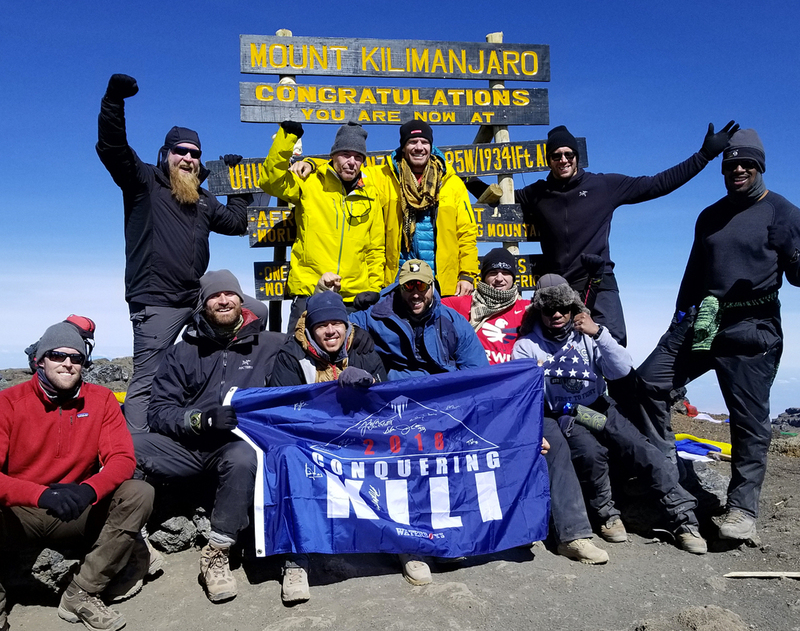 When my longtime St. Louis teammate Chris Long approached me to be a part of his Climbing Kili crew, through his foundation and their Waterboys initiative, I jumped at the chance. I remember a few years back when Chris started his foundation. I was with the Falcons by then, but I happened to be in St. Louis and popped over to this steakhouse in town for his first fundraiser. I went into it unannounced because I wanted to surprise him and see what he was getting ready to do. It was then that I started seeing what Chris wanted to do with Waterboys, and I truly loved the idea. 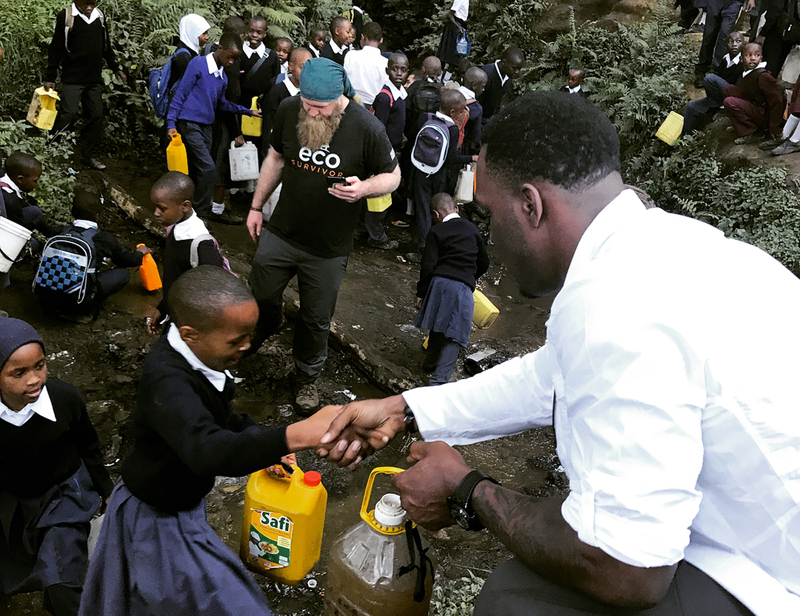 For those who don’t know, Waterboys is an initiative that helps provide clean water to the many people in Tanzania that need it to be able to have a healthy and safe life. I believe he got the idea a couple of years back when people were doing that ice bucket challenge and dumping cold water on themselves. While that was for a good cause, it also got him thinking about how we use water, and how we might use it best. Personally, I can appreciate where he’s coming from because I’ve always had a great understanding of water conservation, being from Las Vegas, where water is kind of like gold. It’s precious. It’s one of those things that you just can’t waste. But sometimes people don’t realize that others are not fortunate enough to have access to those resources we take for granted. Through my own travels, I have seen so much of the world, and I understood that there was a need for an initiative such as this. So even beyond Chris being a good friend of mine, it was cause that I really, truly believe in as well. The work he’s done since has been nothing short of incredible. 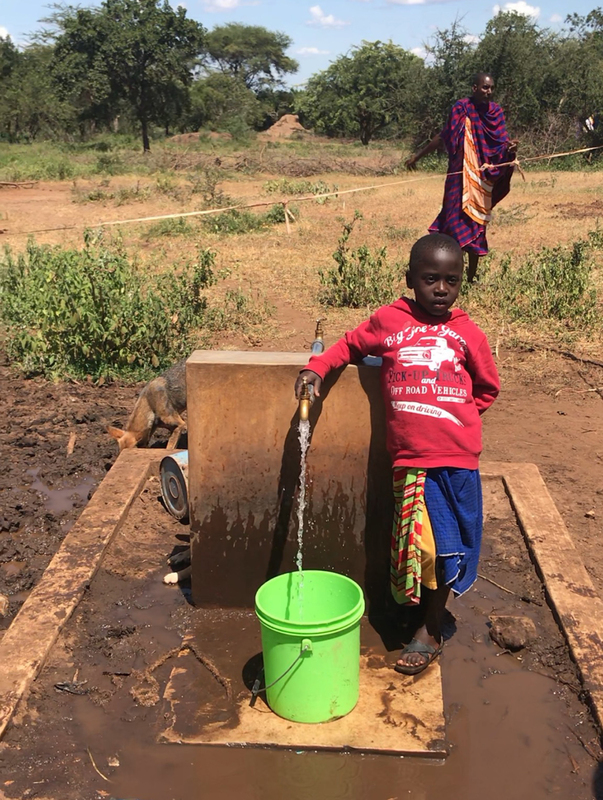 A majority of the people in Tanzania still use traditional sources of getting water, like going to open creeks and finding natural flowing water. Then they have to go and filtrate it and clean it on their own. So it’s quite a task just to be able to use this water for day-to-day needs in society. Through Waterboys, Chris and his crew go there annually, and they’ve successfully sunk over 32 water wells! 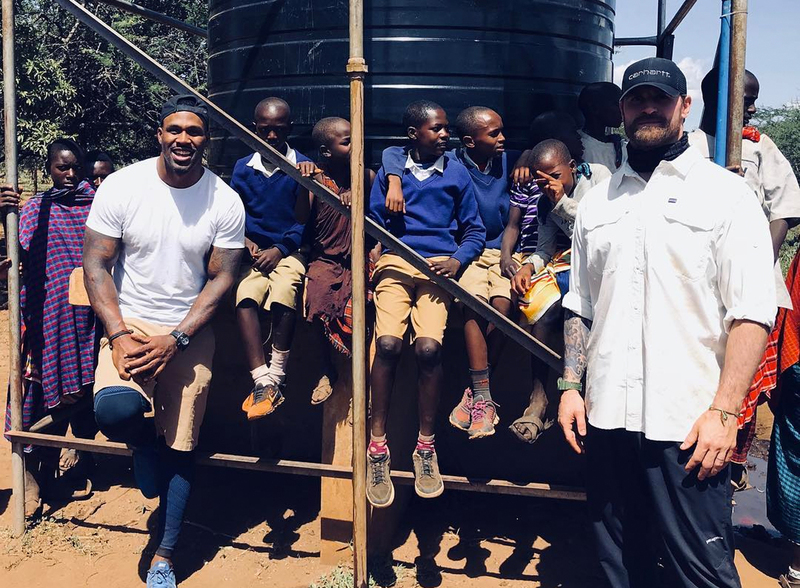 So the point of the trip was two-fold: to continue to bring awareness to the cause, and to continue to build more water wells in hopes of providing clean water to over a million people. 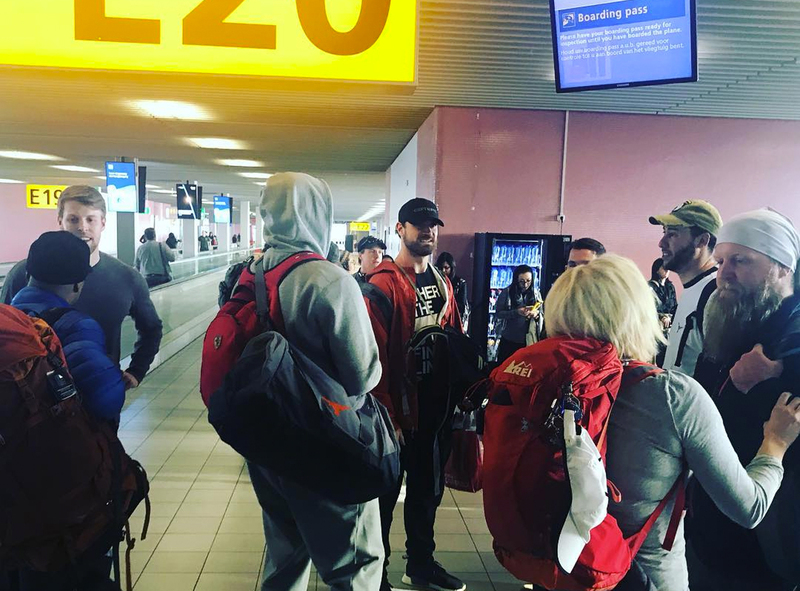 For Chris, this was his third time hiking Mount Kilimanjaro. He initially invited me last year to be a part of it, but I was still at a transitional point in my life, moving on from my own NFL career. I kind of wanted to take a year off, and explore what I wanted to do in the future. This year, it just so happened that I was more at ease with the transition, and it was just more appropriate for me to go. I also saw it as another opportunity to explore the world. I had been to Africa before, but only to the southern part of the continent. So this was my first time in the eastern region of Africa. Traveling in a large group, you know, you definitely move at a slower pace than I’ve become accustomed to moving when I travel, but it was for good reason. The group of guys was great. The whole thing was organized by Chris and his buddy Nate Boyer, who was also a NFL player, but was previously a Green Beret before his stint in the NFL. 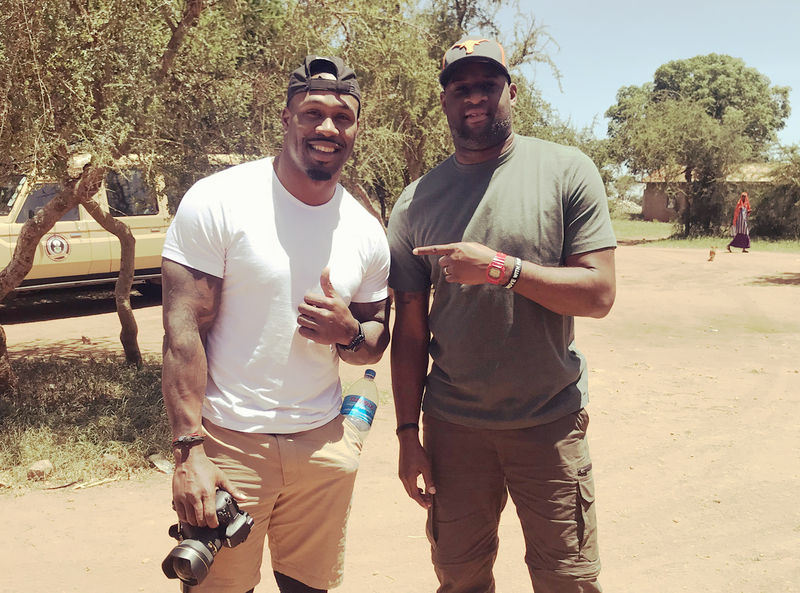 Because of his familiarity with the two, Nate, and by extension Chris, thought it would be perfect to pair up NFL guys with service men and women that had gone to battle. So in addition to having the NFL presence on the trip, there was a military presence that I really enjoyed and appreciated that even more due to my respect for the men and women of our armed forces. Taking such a trip with a group of people who were not only self-determined, but also people who have seen and experienced much of the world from a different perspective, was very enlightening. We may not have moved at the pace that I tend to move at, but I was grateful for that because it slowed me down. I was able to communicate with people, to broaden my understanding of the world and be a part of a team that was giving back for a great cause. It’s funny because getting there was an adventure in itself. It takes nearly a full day. I believe it was a 22-hour travel day, all told. I went through the Netherlands, had a layover in Amsterdam, and then, from there it was an eight-hour flight down to Tanzania. When you get to Tanzania, based on the timing of the limited travel into the area, arrival typically happens at nighttime. So we went to sleep after a long day with an adventure ahead of us. The next morning, I woke up to the sound of prayer. Tanzania is a mixed-religion community and prayer is called through the airwaves of the city. So that was the first thing I heard when I woke up at the hotel. I kind of saw that as an inviting and transformative moment, knowing that I was not there only for vacation, but I was there for a purpose. There are no real streetlights, so when we arrived it was very dark. I didn’t realize how vast or how pretty the land was until I woke up to see how colorful things are in the daytime. It was a great way to begin the mission in earnest. When we went into the villages, we drove two or three hours into “the bush,” where we were welcomed by the locals. They had various parades and welcoming parties for us, not only from the elders, but the youth as well. 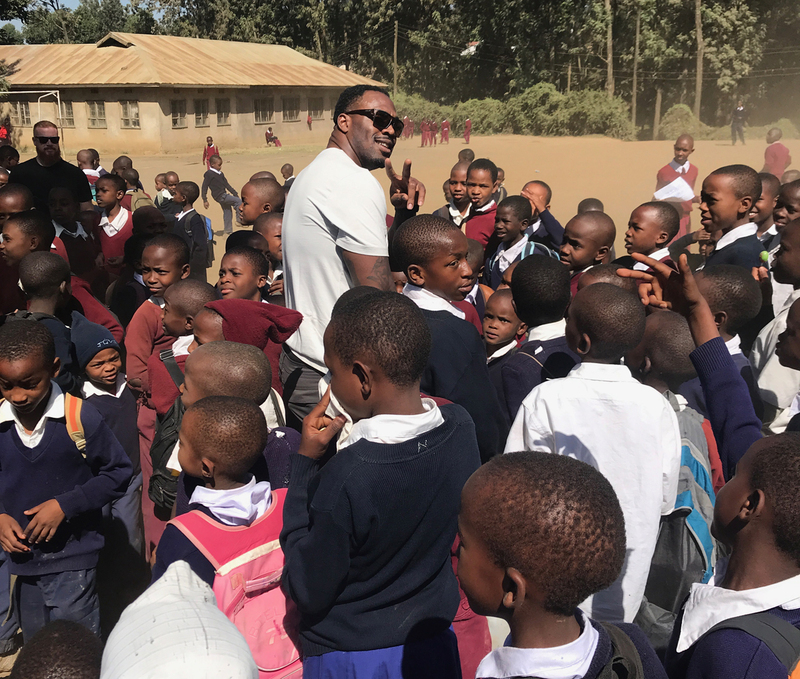 Chris’ mission has helped the youth of that area in particular—they’re benefiting not only from the water wells, but the expansion of schools there thanks to the Waterboys and some affiliated programs. They are helping provide schools so that young people to have places where they can continue to learn, and get an education. So there was just a lot of gratitude for us being there and helping them, honest gratitude that was continually heard and seen by all of us. It makes you feel good, and inspires you to want to do even more to help. So we were all asking what else they are in need of. There was definitely a communication barrier, so you had to have a translator with you. We had four or five with us as part of our group. And you kind of just naturally broke off into the small groups, and you talk. You laugh. You joke about things. The time spent there was also very much a cultural exchange. Not only were the locals happy to see Chris again, but I think they enjoyed having a chance to interact with me and the other guys. They were pretty fascinated with my tattoos…and our physical differences: my shirt size, how broad my shoulders are, things of that nature. In turn, I appreciated the opportunity to share the African-American experience with the native Africans. I thought that was pretty cool. I was also kind of shocked by the influence of American culture over there. There are obviously some cultural things that they didn’t understand, but there was also a lot they did understand from what they’d seen. I stopped and took a picture in front of the barbershop there, because I was surprised to see them have pictures of rap artists, and these different designs and these different cuts that are available to people there. It kind of shocked me. I’m here in the middle of the bush, two or three hours from any major city, and for them to have those kind of posters and kind of wanting to try to emulate that look—I was just taken aback by that. As the day went on, we checked out the schools and the water wells that Chris has funded in the past, and also the new locations where they will be building. To see the impact this initiative has had over there was incredible. They don’t have to walk miles to get clean water anymore. That trek is what the hike up Mount Kilimanjaro, that we took later in the trip, represents. It’s the length that natives may have to go to find water and bring it back to the villages so they can all use it. But this well gave them water that they didn’t have to walk miles for, that they didn’t have to go and boil, or go through the various ways of cleaning it from the creeks or other sources. They could turn a knob, and it flowed freely, and it was abundant. You could just see that it helped not only the people, but their livestock and their crops. I assumed that the people used this well water just for their needs personally. But it’s more than that. All the children in the school had access to fresh water as well. It was also going to be used to provide better conditions in the school, to allow them to prepare for the kids. Not only to drink, but to be clean, to be used for cleansing, to cook with. I just never thought about how it would be used right down to the operation of the school as well, and not just for personal use. You kind of take for granted the different uses of water that we have every day. To see what it meant to them was surreal. The whole trip was life-changing, but to be able to help these people directly, to be the change, it was life-changing for me without a doubt. It’s all about perspective, and it put in even greater perspective the importance of fresh water and natural resources. It really hit me there, and I do believe it will stay with me. After two days in that part of the country—one in the village and one in the city with the school—that gave us a total of three days to get acclimated to the time zone and to Africa. Then it was time to hit the mountain for the hike! 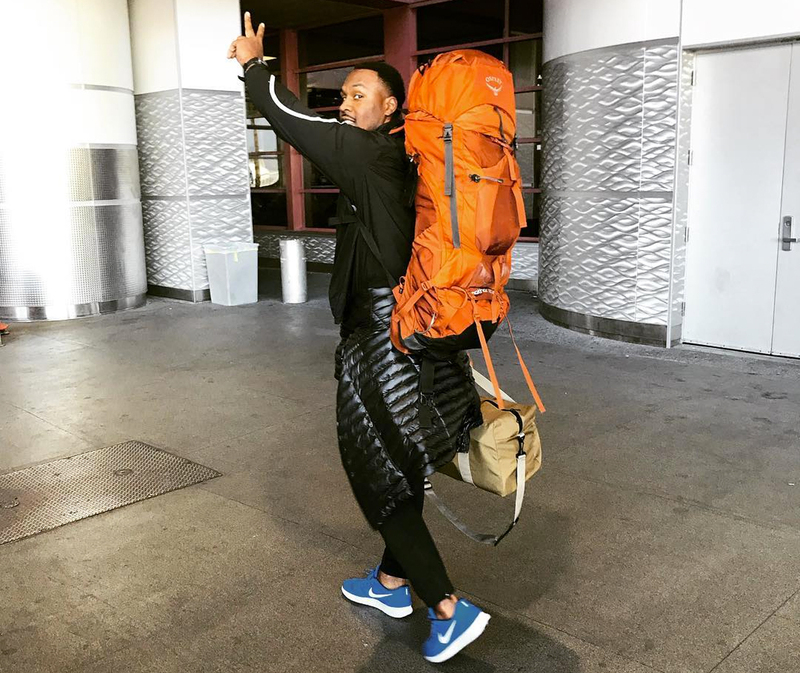 We completed the hike in six days, and that in itself is a challenge, but it’s necessary. You have to slow yourself down and not be in a hurry, because you’ve got to allow your body to adjust to the altitude. The higher up the mountain you get up, the harder it is to breathe the air because it gets so much thinner. So it’s more about endurance than anything else. You’ve got to have strong legs, and I knew that it was something I needed to train for, after all this time off from playing professional football. So I really hit it hard in January, and did a ton of hiking around the area between Nevada and California. I hiked if not every day, every other day. I got about 16 hikes in within a 31-day time frame. Although I couldn’t duplicate the altitude, I was able to duplicate a lot of the different surroundings of the experience. So that was good for me, and it made things a lot easier for me than maybe they would be for some guys that don’t have those advantages—guys living in a city, and just having the weight room and doing like a StairMaster. I’ve always enjoyed hiking. I didn’t do it much for training during my career, but it was something that I had done on my vacations, all over. Now that I have invested in real gear, and I am actually into the culture of it, I believe it is something that I will do because I do enjoy it. I also feel better. I feel in shape! But everyone is different. 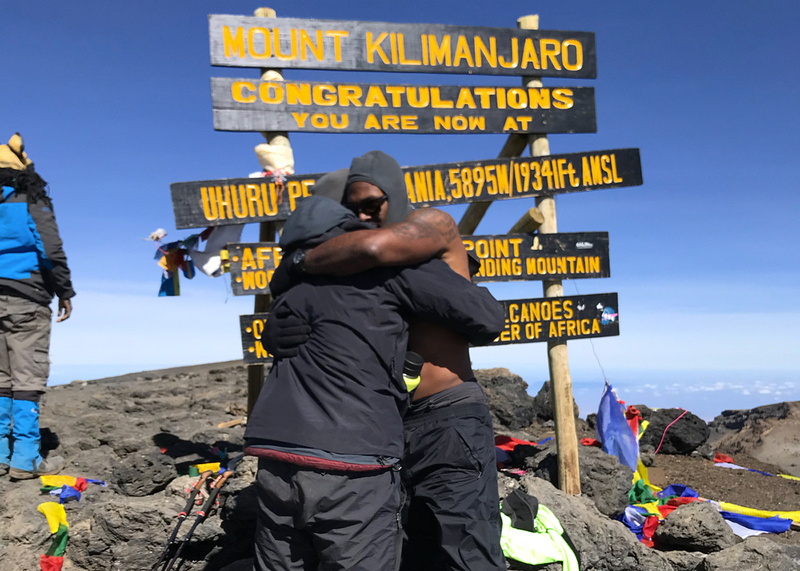 Doing all those kind of hikes to tackle Kilimanjaro all in one month was able to help me. I wouldn’t say it’s able to help everybody else, but I definitely felt good. I felt like I was prepared for the hike and obviously, getting to the top is proof. There are so many different challenges that go into a hike of this nature, but I just tried to enjoy it as much as I could. During the hike, the coolest thing for me was actually being able to stargaze in a place where I could really appreciate the Milky Way, seeing the Big Dipper, and seeing the North Star, all these things that you read about in school and you hear about, navigation-wise, that people use. It was just amazing to see it without the light pollution or the hecticness of the world around you. I felt like I could really feel the energy of the stars, being that high up and just stargazing. It was almost like a spiritual cleansing in a sense. Being out there in nature, you are able to hear your inner thoughts, and enjoy the beauty of the land and not just be stuck in front of a screen—be it your phone, your computer, or television. I think nature, out and away from the chaos of the world, allows you to discover who you are more. And I would say the hardest part of the hike was the last two days, right before we hit the summit. For the first few days, we took it kind of easy. We would do five-hour days and then we would stop, set up base camp, and get adjusted to the altitude. But as we got ready for the last night, we wanted to get to the top in the sunlight, so we started at midnight. It was our longest hike by far, and took us nearly eight hours to get to the summit, which is over 19,000 feet. So imagine hiking for eight hours and you are walking through the dark for about six of those. And then there are those moments that throw you. Like when I thought we’d finally made it to the top of Kilimanjaro, but it was just the rim. I kind of got a little too excited too early. But once you get to the rim, you still have another thousand feet to go up to the summit. So, it was one of those things—it was like a long walk that just felt like it was never going to end. 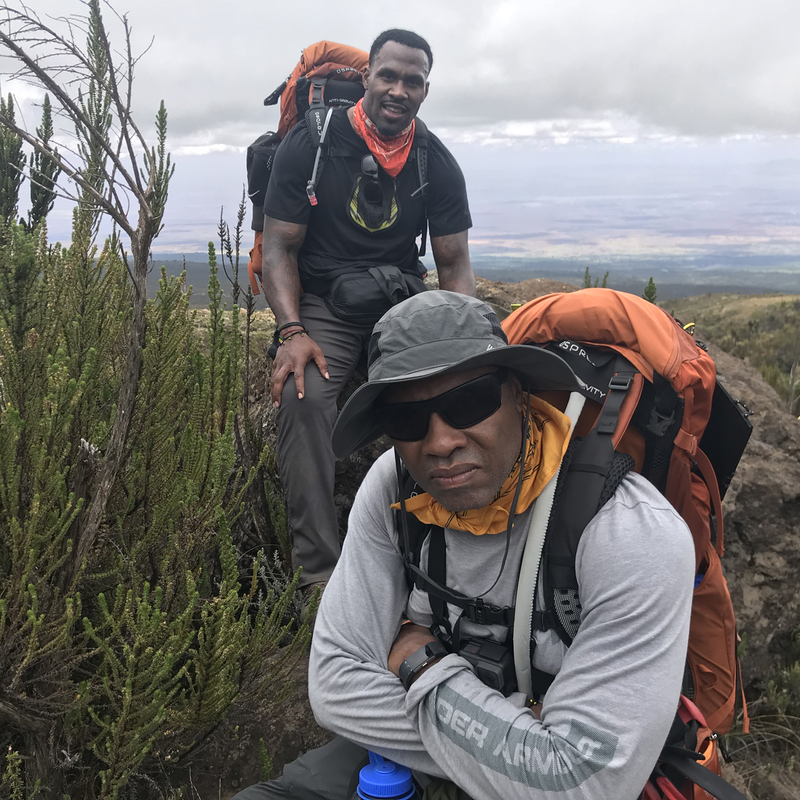 I have hiked a few volcanoes in my travels, in Central America, and in South America, but never to one at 19,000 feet. I think the tallest I had ever been was 12,000 feet. So I surpassed anything that I had ever hiked by 7,000 feet when I did Kilimanjaro. That was a huge accomplishment for me. Once we got to the top it was about -5 degrees, but I’d told myself I had to take my shirt off and soak it in naturally. It felt like going out in pre-game in a cold climate area like Green Bay. But it was something that, for me mentally, I felt like I had to do. No matter what the temperature was, I was going to conquer it—just like I conquered the grueling hike that we had just endured. The other part that was fun was doing this as part of a group. We all felt like a team by the end of it, and it was great to have that feeling again. We all exchanged numbers and have an ongoing group text, where we share updates on what is going on in each other’s lives or talking about things going on currently like NBA basketball and the NCAA Tournament, things like that. It’s pretty cool being part of another team. Any time you meet new people you kind of slowly open up as you become familiar with each other, spend more time together and go through some challenges of the hike together. That’s the type of thing that tends to break down the walls some have up, as we all come to understand that we’re in this for common goal. Talking to some of those guys became just so natural to me. We shared stories, about some of the things that we have experienced as men, understanding that some things are harder to talk about than others. But I think we were all able to gain perspective about certain things from each other’s point of view—be that us players talking about confidential football calls and plays, to these military members being out in the middle of a war zone. So there was definitely fellowship, and we all warmed up to each other. You could tell that guys felt it was a great thing to know that they weren’t the only ones that had some hardship or some things that are tough to talk about. And for us as football players, not in the sense of the loss of life, but in the sense of just being a friend to others, you definitely kind of have more in common than meets the eye. It was cool to get to know some of the other NFL players on the trip. Other than Chris, I didn’t have a personal relationship with them before, but we all exchanged contacts and I believe we will stay in touch. It was great talking to them about their playing careers, and some of the things they went through off the field as well as on the field. Talking with Connor Barwin, it was really neat hearing him talk about the tradition and culture of the Rams, particularly some things that have carried on and passed through from myself and guys I played with back in St. Louis, that are still in effect in Los Angeles. Just the way they train, the way they prepare for games, those things still being passed down to younger guys. It was also great to formally meet and talk to Vince Young. Our paths had never really crossed in a meaningful way before, but we have many things in common, mutual teammates, be it in the pros or guys that he played with at Texas that I played with later. We both were coached by Jeff Fisher, as well. So, there were some points where there were only a couple of degrees of separation on relationships and friendships, which allowed us to get to know each other even more. We are part of a fraternity, and the more people you know within that fraternity, the better off you are—because staying in touch within that group is much better than isolating ourselves. That’s kind of one of the things NFL Legends is all about. Those guys have a resource in me as well as others, seeing that we all live in different regions, that I can give them contacts for anything that they may need in the future. I think we built a brotherhood through this trip. We all realized that no matter how famous you are, no matter what you’ve achieved in your life personally, we are all very small in the grand scheme of the universe. And that every helping hand that you can provide to someone in need is a thing that can shift that person or that village. It could be a cosmic shift for them in their lives, to help them be able to do the same for someone else later in the future. Just try to be humble, helpful and grateful. That’s the lesson I take from this journey, and one I’ll carry for the rest of my days. You’re a great writer and great person. Loved ya on the Rams. Good luck in all you do. Great men and a great cause! Well done!